When you think of the ocean, what images come to mind? Perhaps you see cresting waves, schools of tuna, or sunlit kelp forests. What you likely don’t imagine is plastic. But by 2050 it’s estimated that plastic debris in the world’s oceans will outweigh fish — a staggering fact given its lightweight nature. Amid this focus on the plastic waste problem, the Chinese government enforced an import ban on 24 waste types (including plastic) earlier this year as part of the “National Sword” campaign. China has been the primary destination for the world’s recyclable materials since the 1980s. Between 2006 and 2012, plastic waste imports increased from 6 million to 9 million tons and 18 percent of that came from Japan, second in volume only to the United States. The ban caused turmoil in Japan as the government scrambled to find alternative avenues to recycle the nation’s plastic waste. Japan’s Reduce-Reuse-Recycle (3Rs) policy — while incredibly successful at promoting recycling in Japan — caused a decline in the domestic plastic recycling business. And despite high levels of participation in Japan’s recycling initiatives, efforts to reduce the use of plastic products in the country are failing. But while China’s waste ban may seem like a major headache, it also presents an opportunity for the Japanese government to revise its policies to the benefit of its citizens, businesses and oceans. But while China’s waste ban may seem like a major headache, it also presents an opportunity for the Japanese government to revise its policies to the benefit of its citizens, businesses and oceans. 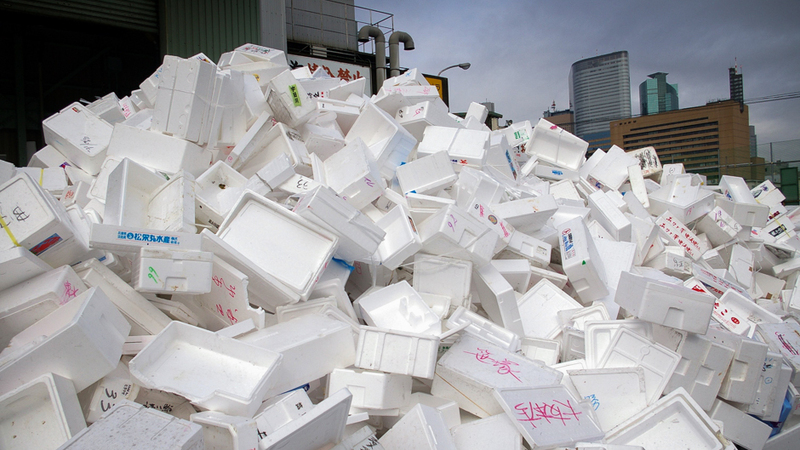 Japan is already a leading nation in its recycling efforts. It can now build on this strong foundation by taking three key actions. First, Japan should introduce regulations on the use of plastic products by prohibiting the sale — or charging a fee — for single-use plastics such as bags, cups and drinking straws. In 2002 Ireland became the first country to introduce a plastic bag tax, leading to a 90 percent drop in use equaling a reduction of more than 1 billion bags. The tax collected was funneled into a green fund to support environmental projects. Rwanda also introduced a ban on the sale, manufacture, use and import of plastic bags in 2008. The ban led to cleaner cities with less trash, less environmental damage caused by plastic waste and increased tourism. Second, Japan should establish specific targets for business and industry to redesign, remanufacture, substitute and/or phase out plastic products. In 2017, a major British retailer removed all products containing plastic microbeads from its stores and replaced plastic bags with reusable bags. In Canada, the adoption of reusable bags has changed consumer behavior, dramatically reducing the use of plastic bags. These success stories are particularly relevant to Japan, given its ongoing preparation for the 2020 Tokyo Olympic Games. Industry sectors have been called on to reduce excessive packaging for all products related to the event. Biodegradable alternatives are being considered, drawing on lessons learned from the 2016 Olympic Games in Rio de Janeiro, where plastic waste was effectively limited. Third, Japan should create a campaign to educate its consumers — and its businesses — on how to adopt eco-friendly waste practices. This has met with great success in Nordic countries, where the International Solid Waste Association gathered manufacturers, designers and waste managers together to strategise how to reduce plastic packaging, encourage recycling or reusable materials in the production cycle and educate their customers on responsible purchasing. The result was a series of ground-breaking reports on responsible resource management that are applicable to all countries. Global plastics production reached 311 million tons in 2014 and is expected to almost quadruple by 2050. Today, just 5 percent of this is recycled and 40 percent goes into the oceans or a landfill. China’s ban on plastic imports is a much-needed wake-up call to reconsider our production, use and disposal of plastic products. Japan has the opportunity to stop looking for the next “easy solution” and instead adopt solid resource management principles to help stem the rising tide of plastic. This article originally appeared in The Japan Times and is republished here with permission. Copyright The Japan Times. All rights reserved. Leticia dos Muchangos is a JSPS-UNU Postdoctoral Fellow at the UNU Institute for the Advanced Study of Sustainability. Her work is related to the development of education programmes for the implementation of the Sustainable Development Goals, focusing on gender-responsive approaches for sustainable consumption and production. Ocean Plastic Estimated at 5.25 Trillion Pieces — But Where’s the Rest?